Formerly known as "The Icon" - now known as "The Residences of U Avenue". I think the height of this one is a little under 700 ft.
Nice looking building, but who really wants to live right on University Avenue? Location: Bi-Situational, Portland & L.A. The bottom third is office and already exists. They'll renovate it and then add ~35 floors of residential on top of it. Tons of people would. The University of Toronto, the Ontario Legislature, all those hospitals/research institutes, on a subway line? And you get to live on the grandest avenue in the country. Any residential going up on this street are going to be snapped up soooooo fast it will make your head spin. The Ritz-Carlton is down the street and I believe those started at $1.5 million. The Ritz-Carlton is down the street and I believe those started at $1.2 million. Count me in as someone who'd be thrilled to live here. University Avenue is truly an architectural tour. Not to mention it's a 15 minute walk to King/John, 20 minute walk to UofT, 30 minute walk to Yorkville and only 10 minutes from the Financial District. To be honest, I was surprised there hasnt been more residential development here. I think I'd go so far to say that I'd prefer it to Bay Street. Subway access is a plus. Very few roadways in the country can compare. However I would preferably want to live on Yonge instead of University. I heard a commercial for this on the radio the other day that advertised it as being the "most prestigious address in Canada." I don't want to open up a whole city-vs-city BS debate, and would ask a MOD to delete this if it descends into that nonsense, but I am curious about the claim. Is University Ave really that highly thought of in Toronto? I don't know. It's considered our grand avenue and boasts hospital row and Queen's Park, but prestigious in the sense of attracting the nouveau riche ? I think that would go to Bloor between Yonge and Avenue. Thanks... hopefully the design doesn't change any more and I wont need to re-make my drawing again. I think that would go to Bloor between Yonge and Avenue. There is movement on the site. 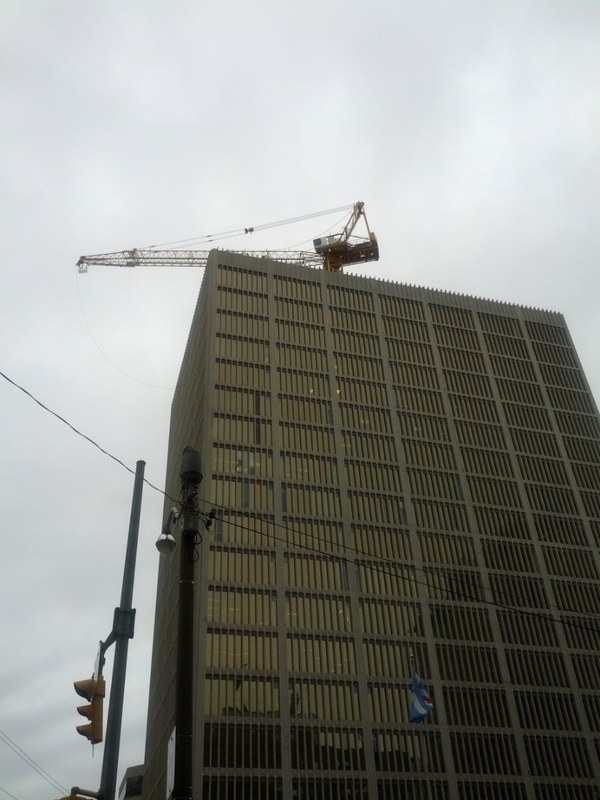 A crane is being erected a top of the current building. August 20th, 2015 by DarkSideDenizen. What about the equally tall building across the street, which name escapes me; any movement on it? ^Thanks, koops. Together they would make a nice sort of gateway on University.